People Inc. is working with Nick Sinatra and David Pawlik of CSS Construction to put up a mixed-income complex on a pair of empty blocks at 1140 and 1166 Jefferson. 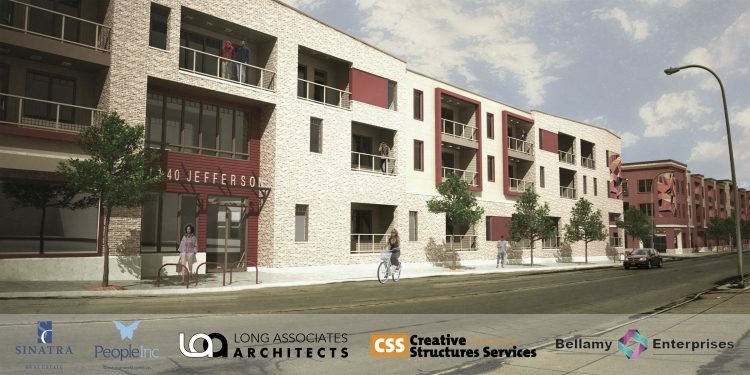 A proposed mixed-income apartment complex on Jefferson Avenue won praise from Buffalo Planning Board members Monday night for its design and anticipated impact on an empty two-block section of the East Side thoroughfare. Members signaled their readiness to green-light the $20 million project after brief presentations on plans for the two three-story buildings at 1140 and 1166 Jefferson, just north of the Johnnie B. Wiley Amateur Athletic Sports Pavilion at Dodge Street. "This is transformative," said Planning Board Chairman James Morrell. "This is going to change Jefferson Avenue, and I just hope more comes." Nevertheless, the project by People Inc., in conjunction with developers Nick Sinatra and David Pawlik, could not be formally approved until after the city's Zoning Board of Appeals weighs in on requested variances to allow twice the lot width and parking. That's now the procedure under the city's new Green Code, which has taken effect in some parts of the city and will be fully in place next month. The Zoning Board meets on Wednesday. "We have to table, but we can send a positive message to the Zoning Board that if we could, we would approve it," Morrell said. 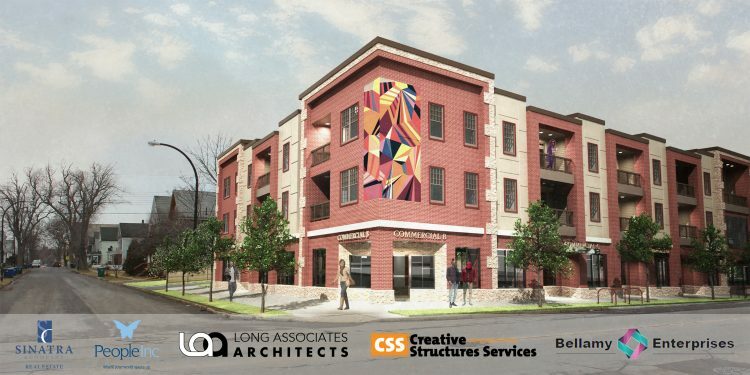 People Inc. last summer announced plans for the 84-unit complex, designed to help jump-start activity on Jefferson Avenue with new residents and businesses, similar to what's already happening elsewhere in Buffalo on Hertel Avenue and Niagara, Grant and Seneca streets. 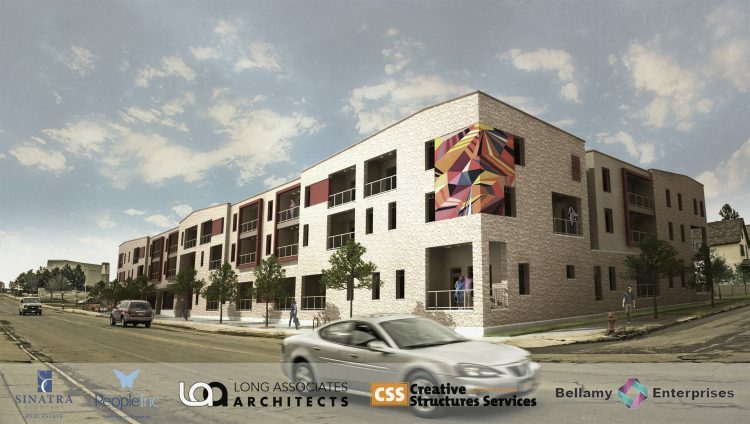 The building, which will have 66 one-bedroom apartments and 18 two-bedroom units, will be aimed at families with incomes ranging from 30 percent to 130 percent of the area median income, or $15,000 to $75,000. Sixteen of the units may be reserved for those with developmental disabilities who can still live independently. The one-bedroom units will have about 625 square feet, while the two-bedroom apartments will have about 850 square feet. The first-floor commercial spaces will house stores and small businesses. 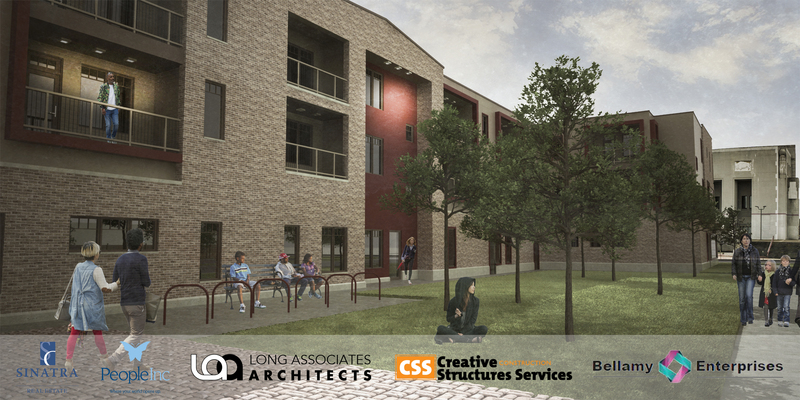 The social services nonprofit is partnering with Sinatra & Company Real Estate and Pawlik's CSS Construction to build the project and will be the majority owner of the new complex. The two developers own much of the 2.4 acres of land, while the city last June designated them as the developers for the remaining properties. Officials spent the past seven months meeting with neighbors, other community members, local clergy and business groups to garner support and solicit feedback for the project. Pawlik said a community meeting held at the Wiley complex was "extremely well-attended" and resulted in various changes to the design, including 6-foot-deep private patios or balconies for each unit. That's in addition to shared community patios and additional open spaces. Each of the buildings will also have a community room and kitchenettes, as well as a staff office, on-site laundry and exercise rooms. "We made a huge effort to make this part of the community," said architect Matthew Long. 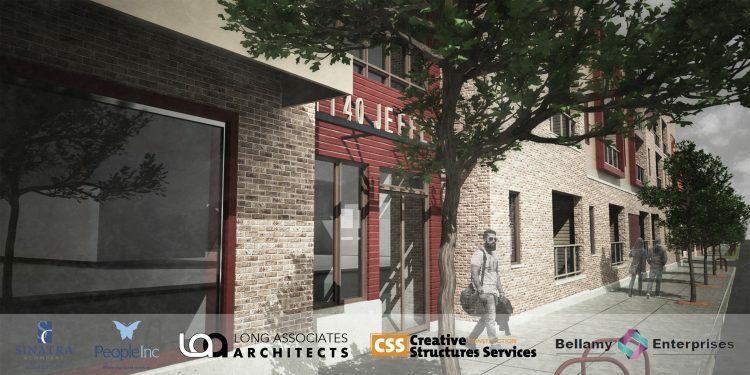 Plans call for the building at 1140 Jefferson Ave. to include 48 units and 8,300 square feet of flexible commercial space. The building will have 59 parking spaces. 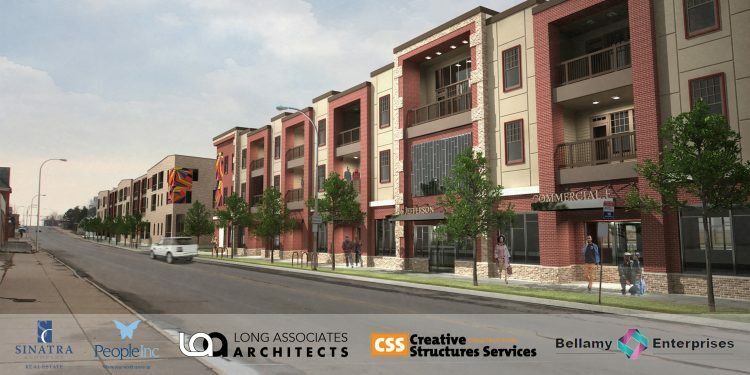 The second building, at 1166 Jefferson Ave., will have 36 units and 14,500 square feet of commercial or retail space, currently divided into nine units. It will have 38 parking spaces. "We've had an awful lot of interest," Pawlik said of the commercial space, citing a gym, a small restaurant, a law office and other amenities as options. People Inc. has also taken an office. Both buildings will also include a total of 28 bicycle racks, with 29 short-term and 26 long-term spaces. "We think it's in the spirit of the Green Code to provide spaces to park your bike," Long said. The buildings will be constructed using a combination of brick, concrete and metal panels. The facades will be broken up through colors and materials into five sections. The south building will use a buffed off-white brick with red accent panels around the porches and entryway, while the north building will swap colors. "I like the red brick better, but I also like the contrast at the two corners," said Planning Board Vice Chair Cynthia Schwartz. "This will be a dramatic improvement on Jefferson." 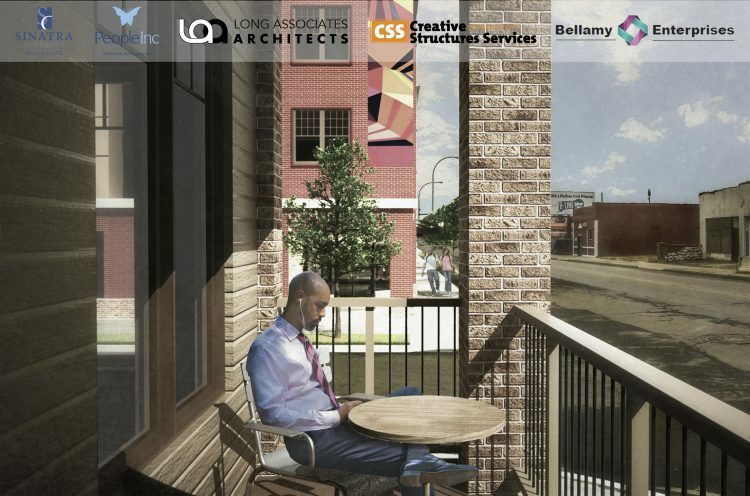 Pawlik said the project will also include a public art component designed through the Buffalo Art Commission. "We are big fans to be able to promote public art," Pawlik said. "The only thing we'll do is pay for it. We don't want to influence it." Once approved, officials will work on financing the project through a combination of state, federal, private and foundation sources, including tax-exempt bonds and credits. Construction could begin in the summer, with completion by summer 2018.